Continuous delivery is deploying software product incrementally with new features as continuously and frequently as needed. It consists of processes and workflows that reduce cost and improve speed, quality and reliability of the software product. One of the milestones in implementing Scaled Agile Framework (SAFe) is to plan a successful Program Increment (PI). This also includes the transparent tracking of committed features and user stories by each team. All of this can be achieved by using a dynamic SAFe tool. To avoid any setbacks, IT and Infrastructure team must participate in these PI sessions and get environments ready accordingly to satisfy the solution and schedule needs. Agile at heart, continuous delivery allows you to seamlessly encounter new requirements and build software with the desired changes and deploy it. Thus this ensures a consistent and an updated flow of changes into production. The releases can be made hourly, daily, weekly, or monthly. It depends on your needs and demand. Nevertheless the ultimate goal is to provide value consistently. Famous technology leaders including Google, Amazon, Netflix, Etsy, and Facebook are able to deploy changes within minutes using a smooth delivery pipeline. 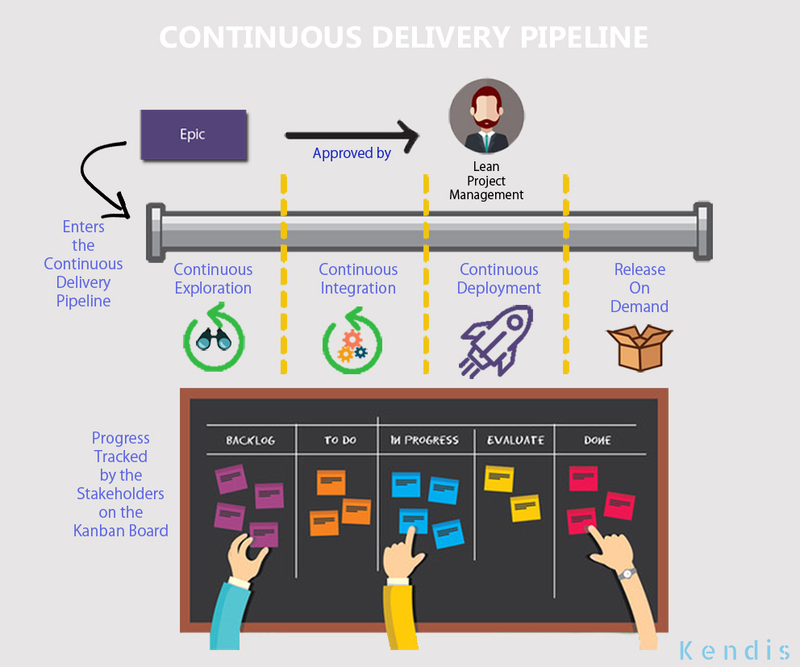 The process of Continuous Delivery is initiated by the approval of an Epic by the Lean Project Management. This Epic presents a business case possessing value. It sets what needs to be achieved. The stakeholders track the progress by using the Program Kanban Board where progress of features can be tracked from team level to business level. Continuous Exploration – The Product Management researches on the epic to obtain its maximum benefits keeping in view all the assumptions and potential measures it gives. This exploration is done amongst customers, key stakeholders, agile teams, business owners. Once the value is obtained, it is broken down into its artifacts. The Program Backlog is made. Continuous Integration – The features from the backlog are taken and then implemented. They are developed, tested, integrated, and validated. Team follows DevOps principles to integrate and deploy code. Continuous Deployment – Once the features are made, they are deployed. Automated Testing of features and non-functional requirements is done. Release on Demand – The software is ready to be deployed on demand. They are released as soon as they become available and whenever it is needed. In the Scaled Agile Framework, there is a continuous delivery pipeline in every Agile Release Train. Building and deploying releases manually is a slow and tiring process which raises the chances of errors. With these practical tips, we aim to help you achieve a continuous delivery pipeline. Competent technical team members to design and implement a continuous delivery pipeline. The design should describe various stages of the pipeline from code repository(Git) to Production. Pipeline architecture takes into account the needs for scaling to any number of servers and design of automatically healing system in case of software or hardware failure. Making sure that automatic recovery system does not take time using dynamic and optimized database and its design. For troubleshooting, maintain delivery pipeline artifacts and keep centralized logging. Monitoring of the cluster is an essential practice for disaster control. Analyzing and defining the “Definition Of Done” into the delivery pipeline workflow. This should also include automated testing at different levels of deployment and helps in clear coordination. Have an auto-scaling plan to keep your solution robust and to scale available resources as soon need arises. Periodically using Continuous Delivery Analytics that provide you with the crucial numbers to analyze signals and their relationship to ROI. Next Post Next post: How Kendis can help agile teams using Jira to adopt SAFe (Scaled Agile Framework)?